This up-to-date resource on restorative justice theory and practice is the literature’s most comprehensive and authoritative review of original research in new and contested areas. Bringing together contributors from across a range of jurisdictions, disciplines and legal traditions, this edited collection provides a concise, but critical review of existing theory and practice in restorative justice. Authors identify key developments, theoretical arguments and new empirical evidence, evaluating their merits and demerits, before turning the reader’s attention to further concerns informing and improving the future of restorative justice. 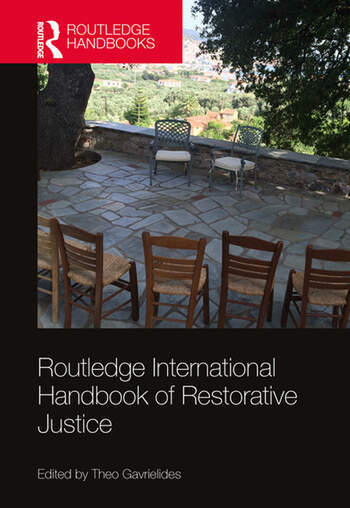 Divided into four parts, the Handbook includes papers written by leading scholars on new theory, empirical evidence of implementation, critiques and the future of restorative justice. This companion is essential reading for scholars of restorative justice, criminology, social theory, psychology, law, human rights and criminal justice, as well as researchers, policymakers, practitioners and campaigners from around the world. Theo Gavrielides, PhD, is an international expert in restorative justice, human rights and youth justice. He is the Founder and Director of The IARS International Institute, a user-led NGO that empowers marginalised groups to influence social policy and law internationally. He is also the Founder and Director of the Restorative Justice for All Institute (RJ4All) as well as Adjunct Professor at the School of Criminology of Simon Fraser University and a visiting professor at Buckinghamshire New University. Professor Gavrielides is an expert advisor to the European Commission’s criminal justice and equality projects, and has worked with many governments on justice reforms. He has worked as the Human Rights Advisor of the UK Ministry of Justice as well as a researcher at the London School of Economics, and he is the Principal Investigator of numerous EU, UN and UK funded research programmes. Dr. Gavrielides has published extensively in the areas of restorative justice, legal philosophy youth policy, human rights and criminal justice. He is the Editor of numerous collected editions as well as the Founder and Editor-in-Chief of the Youth Voice Journal and the Internet Journal of Restorative Justice. He is also the Editor of the International Journal of Human Rights in Healthcare.